A supernova remnant (SNR) is believed to be the expanding heated gases left over from the outer shell of a massive star that became a supernova. When a star runs out of nuclear fuel, it collapses on itself in a mere two seconds, creating a brilliant explosion of energy that is mind-boggling (enough to fuel eighty million stars the size of the sun for nearly a century!). When astronomers apply physical laws to the SNR they can predict in three basic stages what should occur. If the Milky Way galaxy were really billions of years old as evolutionary astronomers claim, then many SNRs should be observed. Mounting evidence however, reveals a wide discrepancy between the number predicted and the number observed. In fact, the numbers are far close to a galaxy of thousands rather than billions of years old. The numbers for the Large Magellanic Cloud, the Milky Way's satellite galaxy, also supports a young universe. The utter dearth of SNRs is a baffling mystery to secular astronomers but an affirmation to God's creation of the cosmos less than 10,000 years ago. A nova is believed to occur when one of two binary stars is a white dwarf. When hydrogen starts to transfer from the normal star to the surface of the white dwarf, eventually enough hydrogen accumulates that it suddenly is pressured into thermonuclear fusion by the extreme gravity of the very dense white dwarf. This neatly explains repeating nova stars, because it takes a certain amount of time for the hydrogen to accumulate and then it burns into helium in a spectacular flare of light. After burning all the hydrogen, the nova seems to die down while more hydrogen accumulates. A Supernova seems to depend on a star's mass being greater than the Chandrasekhar limit. The Indian astronomer Chandrasekhar calculated that if a star has a mass greater than about 1.4 solar masses, its gravity can shrink it to the point that it even the atomic nuclei that make up the star cannot stand up. White dwarfs are found to be always smaller than the Chandrasekhar limit, and can maintain their size because their atomic nuclei hold up. A supernova is much, much brighter than a normal nova, and can so far only be studied in other galaxies, since earth has not seen a supernova in the Milky Way galaxy since telescopes were invented. Supernovae seem to come in two types, known as type I and type II that differ in their spectra (type I tends to have little hydrogen, while type II usually has bright hydrogen lines in its spectrum) and how long they last. Type I supernovae are thought to happen when a white dwarf in a binary star accumulates so much helium from fusing the hydrogen it steals from its partner star that it is suddenly larger than Chandrasekhar's limit. The white dwarf breaks down even its atomic nuclei and explodes with an enormous amount of energy. Usually it does not leave behind a remnant (Faulkner p. 80). A Type II supernova is presumed to occur when a large, massive star accumulates a core of spent nuclear fuel (probably iron) that becomes larger than the Chandrasekhar limit. That core suddenly degenerates into a Neutron star or possibly further to a Black Hole and releases the same amount of energy underneath the huge layers of gas that make up the rest of the star outside of the core. This explosion essentially blows the outer parts of the star into a huge expanding ball of superheated gas that eventually expands and cools, leaving what is known as a Supernova remnant. The Crab Nebula is thought to be the remains of a supernova that occurred in our galaxy and was seen from earth in AD 1054. Danny Faulkner suggests that one major challenge to the standard model is the lack of old Supernova remnants. Theory suggests that supernovae should be visible for several million years, but yet we find almost none that are more than a few thousand years old. 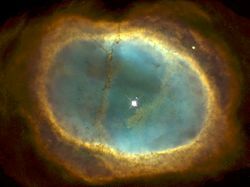 Supernova remnants are usually much larger than planetary nebulae, and normally are still hotter and therefore brighter than a planetary nebula. ↑ Exploding stars point to a young universe by Jonathan Sarfati. Creation 19(3):46–48. June 1997. The Crab Nebula by Don B. DeYoung. CRSQ 43(3):140-146. December, 2006. This page was last modified on 7 May 2010, at 20:24.